The development of total knee replacement followed soon after successful hip replacement procedures. Even though earlier designs of total knee replacement were not as successful as Sir John Charnley's artificial hip, over the last three decades, there have been dramatic advancements that led to the development of knee implants which appear to be as durable and successful. Who benefits from Knee replacement? Knee pain limiting everyday activities such as walking, bending or stair climbing. The surgical procedure usually takes about 90 minutes. The damaged cartilage and bone will be removed and replaced with new metal and plastic joint surfaces to restore the alignment and function of your knee. Many different types of knee implants are currently used for knee replacements, but the design principles are similar. The arthritis surface of the lower end of femur bone (thigh bone) and the upper end of the tibia bone (leg bone) are removed and replaced with a metal implants. A plastic insert is placed in between the tibial and femoral metal implants to provide smooth movements in the joint. Replacing the patellar (knee cap) articular surface is controversial. In general, if the patella joint is significantly arthritic and contribute to the patientâ€™s symptoms, its damaged articular surface is replaced. Recently, after successful introduction of minimally invasive hip approaches, similar muscle sparing techniques have been developed for knee arthroplasty. By avoiding cutting through the important Quadriceps tendon to access the knee joint, it is possible to have better earlier muscle control following surgery. However, these techniques have not been as established as the hip approaches and the long-term benefit from these newer procedures remains to be seen. You will usually stay in the hospital for about 3-5 days. Special attention will be given to pain relief to make your post-operative experience as comfortable as possible. You will commence knee physiotherapy soon after your general condition permits after surgery. Due to the refinements in pre-operative preparation, surgical technique, surgical pain management and post-operative rehabilitation, the duration of hospital stay following a total hip replacement has been considerably reduced recently. 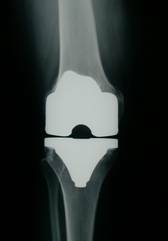 The complication rate following knee replacement surgery is low. Serious complications, such as joint infection, occur in less than 2 percent of patients. Blood clots in the leg veins or pelvis are the most common complication of knee replacement surgery. The blood thinning medication is routinely prescribed to prevent such blood clots. Other measures of blood clot prevention include inflatable leg coverings and foot pumps. Other complications such as nerve and blood vessel injury, bleeding, fracture and knee stiffness can occur. In a small number of patients, some pain can continue, or new pain can occur after surgery. Over years, the knee prosthesis may wear out or loosen. This problem will likely be less common with newer materials and techniques.